Au Fil du Jardin: Misc. Thank you for your comments on the market. I know several of you would have loved it. I love my salad bowl. Although I'm on my own, I usually cook my meals, and like to make them pretty. My kitchen cabinet is full of bento boxes for lunch. I needed something for dinners and breakfast. You are right, it was difficult to resist the shoes. I have the hope that the seller can be found at another session. The reason I was able to resist, is that I've just changed glasses. Before going to the market in Aix, I went to a garage sale, and found those cuties. Hooks, the kind our grand-mothers would use to remesh stockings. Nobody does that nowadays, and it is a shame. Maybe not for standard stockings, but I've ruined tshirts or fancy stockings with a mesh getting loose, and wished I had those hooks to fix them. The set is not complete, two of them can be fixed on a support, the other two can't, so I guess they are not of the same kind either. They belonged to the seller's grand mother. She was selling them for nothing (1 euro), but was glad I took them home to give them another live. Any advice on how to clean them? Let's finish with a green picture. When I go in Aix-en-Provence, I park my car in a parking lot, choosing between the two in the center of town. 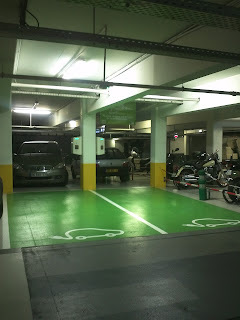 Yesterday, I discovered those two places for electric cars. For the moment, they offer the reload of the battery. How cool is that? A friend of mine has a huge collection of glasses and they all came with a good reason/excuse/ story! I like her glasses. I can see why you gave in for the glasses, they are very cool! Interesting about the new electric car spaces - is that at the Rotonde carpark? We have a solar charging 'thing' (it looks like a weird big umbrella' in our village but I've yet to see anyone use it. I love the butterfly glasses too! How cool that they have "green" car parking spaces with a recharge! you'll look great in the butterfly glasses. they are sooo very you.